CycloMed99 is a national consortium led by TRIUMF that includes experts from the BC Cancer Agency, the Centre for Probe Development and Commercialization (CPDC), the Lawson Health Research Institute, and the University of British Columbia. Our research is focused around advancing current nuclear medicine technology to ensure a supply of non-reactor based technetium-99m (Tc-99m) for Canada and the world. This important isotope is used worldwide in tens of millions of medical procedures each year for diagnosing diseases in the heart, bones, and elsewhere in the body. For more information about the need for non-reactor based production of isotopes please see The Problem. In January 2015, our team announced a breakthrough in producing Tc-99m: we demonstrated a process that enables the routine production of sufficient Tc-99m to satisfy the daily demand for a population the size of British Columbia – or 500 patients – from a six-hour run on a common brand of medical cyclotrons. You can find more information about how this process works under The Solution and How It Works. To see a history of our progress to date, please see our Timeline page. You can find links to our media such as videos, pictures, publications, and graphics here. Drs. Francois Benard, Paul Schaffer and Tom Ruth next to a cyclotron beamline at the BC Cancer Agency. Photo cred: NSERC 2015. The TRIUMF CycloMed99 group, including, from left to right: Stefan Zeisler, Stuart McDiarmid, Victoire Hanemaayer, Brian Hook, Maurice Dodd, and Ken Buckley circa 2013. Since 2007, the world has experienced several major supply interruptions of medical isotopes, especially Technetium-99m (Tc-99m) when the reactors in Chalk River (Canada) and Petten (the Netherlands) were stopped for unplanned maintenance and repairs. The shortage of this isotope was felt around the world by many different types of patients and their families alike. Since those incidents, TRIUMF has been working with a national team, known as CycloMed99, to develop alternatives. With funding from Natural Resources Canada (NRCan), TRIUMF is developing and deploying a solution that will push medical isotope production from just a few large, global facilities to a system involving local hospitals and clinics that already maintain an infrastructure for producing medical imaging radioisotopes. This paradigm shift will dramatically modernize the production and distribution of medical isotopes and empower hopsitals and clinics to produce their own full suite of isotopes. TRIUMF and collaborators are using existing medical cyclotrons to implement the direct production of technetium-99m (Tc-99m) without nuclear reactors and without uranium. By enabling regional hospitals to produce and distribute this lifesaving isotope to local clinics, widespread supply disruptions will be an issue of the past. The TRIUMF-led team is participating in the second wave of support from NRCan via the federal ITAP program that was created in Budget 2012. 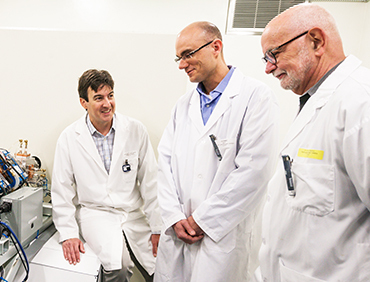 With support from the NRCan and previously CIHR and NSERC, a world-class group of scientists have partnered to deliver an alternative technology for producing Tc-99m, the world’s most commonly used medical isotope. The experts working on this effort are based in different areas of Canada and are familiar with their regional isotope needs.